This past Sunday night our church hosted their annual Trunk or Treat. With this being McKinley's first Halloween, we had to participate. Over the past month I have looked & looked for a costume for M. I wanted one that was cute and budget friendly, but I wasn't having any luck finding anything that fit that criteria for a 6 month old. Then I remembered an outfit that Bubba & Grammy gave us at one of our baby showers. Crossing my fingers that it would fit, I put it on McKinley and we ended up with a cute little "Sweet Pea". We had a great time getting to see all the kiddos and adults dressed up. Now that we have a little one I am thinking the entire Organ clan will dress up next year! 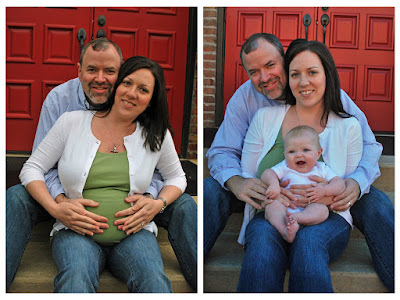 Before I was even pregnant, Mike and I knew there would be added expenses once we had a baby. We knew there would be diapers, clothes, toys and all the other items that Babies R Us tells you you need:) But nobody ever told us that one of the expenses would be a deep freeze. I'm sure it isn't a necessity for every new parent, but if you look at the picture below it was obviously a necessity for the Organ Household. Our regular freezer was packed so full that I couldn't buy ANYTHING at the grocery store that needed to be frozen. So a couple of weeks ago Mike and I purchased this deep freeze to hold all that golden goodness. After moving everything from the upstairs freezer to the deep freeze, it is already halfway full! I recently realized that other than some pictures taken during the first two weeks of McKinley's life, there weren't any recent pictures of Mike and me with McKinley. So a few weeks ago my mom snapped some needed photos. A big thanks to Grammy for taking the pictures and to Aunt BJ who probably made a fool out of herself getting McKinley to smile. 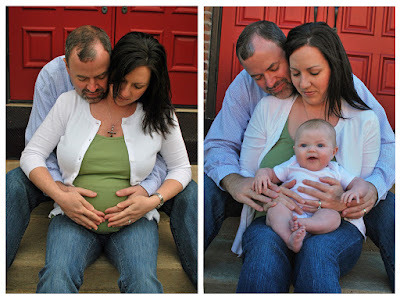 This past April, I shared this post of the amazing pre-baby photos my mom took of Mike & me. My mom (or Grammy as she is now known:) thought it would be fun to take post-baby photos of us at the same location, in the same poses (or as close as possible), wearing the same clothes and putting McKinley where my round belly used to be. Mums, and Pumpkins, and Gourds...Oh My! Every October, Mike and I make a trip to the Nashville Farmer's Market to purchase the necessary fall decor for our front porch. This year was extra special because it was our first Farmer's Market trip as a family of 3! McKinley slept the majority of our time at the Market. ....which she decided to lick! This picture makes me laugh because it looks like she is thinking "Come on, really!?! You are making me pose for a picture with a tiny pumpkin!" A few weeks ago the Organ clan made our way to St. Louis to visit my cousin Maya and her husband. The reason for the visit was to meet their new son and introduce them to McKinley. 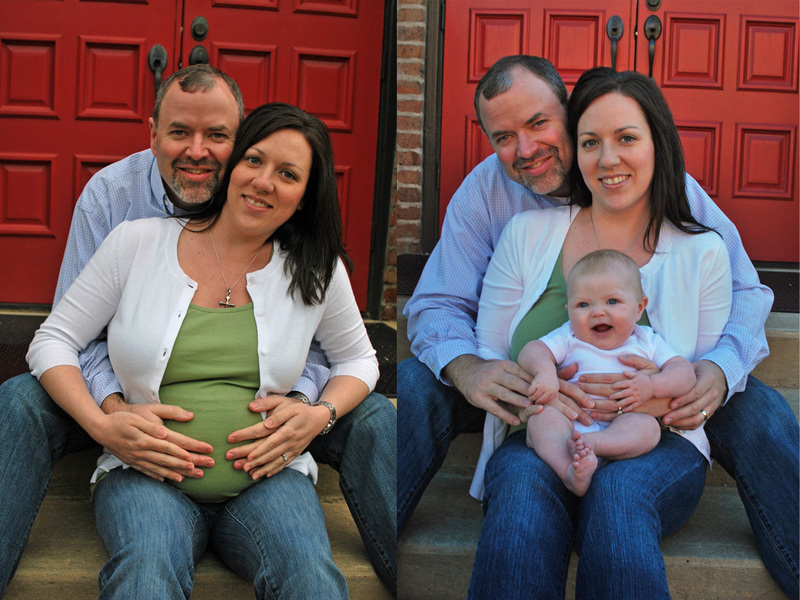 Maya and I were pregnant at the same time and our children were born exactly two weeks apart. We had such a great time getting to see everyone and catching up. I am so excited that our little ones are so close in age and I predict they are going to be great friends, just like their mommas! It seems like it was just yesterday when each of our families opened a gift bag containing a precious little onesie that revealed that we were expecting! 12 months later, here is a picture of our little cheese ball wearing that special onesie.